So who am I and what makes me such an authority on the UK Virtual Assistant industry? My name is Justine Curtis and I have been running a virtual assistant practice (My Virtual Assistant) since 2003 when the idea was fairly new in the UK. During the set up process I became acutely aware that there was precious little UK specific information available for both those wanting to start their own Virtual Assistant business and potential clients who wanted to know who Virtual Assistants were and what we could do for them. At that point the idea behind what is now The UK Association of Virtual Assistants was born. I went on to write the first guide in this county on ‘Setting Yourself Up As A Virtual Assistant‘ and then teamed up with Emma Walker to set up the VA Success Group, the UK’s premier virtual assistant training and mentoring company. 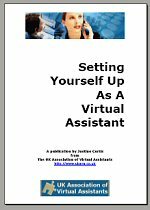 So as far as the Virtual Assistant industry in the UK is concerned I run my own practice, My Virtual Assistant, which has now expanded to cover the UK through a Licensing system, you can view the details of the Virtual Assistant License Package at www.myvirtualassistant.co.uk, I run the UK Association of Virtual Assistants, I wrote a guide on “Setting Yourself Up As a Virtual Assistant” and now actively teach aspiring VA’s how to set up on their own as successful Virtual Assistants. All of these activities keep me actively involved in the industry and well informed about what is going on behind the scenes. The idea of this blog is to pass on more of that information to my readers. Please feel free to comment on posts and ask questions if you have any. I look forward to hearing from you.